Research & Education Association, 9780738609546, 421pp. 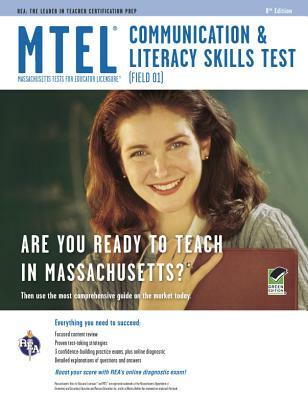 Scoring well on the MTEL Communication & Literacy Skills Test (Field 01) doesn't just help you get certified to teach in Massachusetts, it helps you build your career. Our popular test prep was designed for prospective educators seeking a Massachusetts teaching license. Teacher candidates take the MTEL as they are nearing completion of, or have completed, their undergraduate work. Our comprehensive test prep is fully aligned with the standards of the Massachusetts Department of Education and is based on the most recent official test specifications. The book contains in-depth reviews of all the topics covered on the reading and writing portions of the exam, including vocabulary, reading skills, written mechanics, and grammar. Chapter drills with detailed explanations of answers reinforce the specific skills and abilities needed for the test. Three full-length, multiple-choice practice tests in the book simulate the actual MTEL Communication & Literacy Skills test. Each practice test is balanced to include every type of question, subject area, and skill tested on the exam. Our practice tests replicate the multiple-choice and open-ended portions of the official exam, allowing you to assess your skills and gauge your test-readiness. Every practice exam comes with detailed feedback on every question. We don't just say which answers are right--we explain why the other answer choices are wrong--so you'll be prepared on test day. Our detailed explanations of answers help you identify your strengths and weaknesses while building your skills. This complete test prep package comes with a customized study schedule and REA's test-taking strategies and tips. REA books and software have proven to be the extra support teacher candidates need to pass their challenging tests for licensure. Our comprehensive test preps are teacher-recommended and written by experts in the field.